Learn how to Get Music from iPhone 4S to iPhone 5. 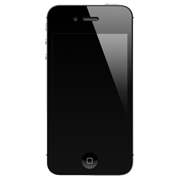 Read on to find a simple and instant solution about Music from iPhone 4S to iPhone 5. I have an old iPhone 4S with 3000+ music on it, and a new iPhone 5 I want to sync it to. I keep seeing all these programs you need to buy, which I don't want, and only a small percent of the music was purchased from the iTunes store, so that's not helpful either. Is there any complete way to get music from iPhone 4S to iPhone 5? It would be very helpful if you'd like to recommand me a tool to handle this. So how do you get music from iPhone 4S to iPhone 5 without any complicated settings or iTunes limits? Before answering this question, we want to remind you that Apple simply aims to use this approach to prevent the pirate of iTunes music, if you have do nothing against Apple copyright terms, please read on to get our recommanded solution. As long as you keep using iTunes, you'll find it is impossible to get music transferred among multiple devices. At this moment, you can simply find a versatile iTunes Alternative for iPhone/iPad/iPod management. We recommand you AnyTrans because of its flexibility. Thanks to supporting multiple devices at once, it will move music from iPhone 4S to iPhone 5 with one single click. How Do You Get Music from iPhone 4S to iPhone 5 by Using AnyTrans? First of all, AnyTrans is completely clean and safe to use. You can get it here. And after a few seconds installation, you can make use of it by following steps. Step1. After you free download and install AnyTrans on Mac/PC, then connect iPhone 4s and iPhone 5 to Mac/PC via two USB cables. Step2. Run AnyTrans and it will show the storage conditions of your iOS devices. Just click the device name to check on the homepage. Step3. Click on "Audio" > choose the "Music" to enter the manage page. Step4. Pick up the music you want to sync from your iPhone4s to your iPhone5, and click the "to Device" button. 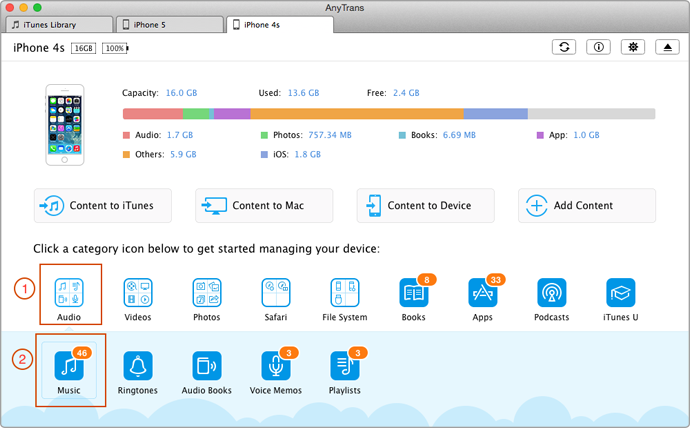 AnyTrans is a good management tool to help you transfer music, videos, and more between your iOS devices. If you still have any question, please inform us by leaving a comment. If this tutorial is useful, please share it with your friends. Download the free trail to have a try on AnyTrans.